“Quick story.” If that phrase makes you think of CMI Chief Strategy Officer Robert Rose, you’ve probably been following Content Strategy for Marketers, the weekly newsletter that he kicked off a year ago. Every Saturday, subscribers eavesdrop on his conversations, learn about what he’s reading or watching or listening to, and discover, as he weaves one quick story into another, his latest observations on content marketing and content strategy. You can download an anthology of all of Robert’s Content Strategy for Marketers musings, and keep reading for a sampling of Robert’s messages that I’ve found especially thought-provoking, useful, and inspiring. 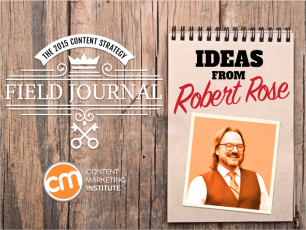 “Content is perhaps the most important business asset that we fail to manage as well as we could,” Robert says. What does it mean to treat content as a business asset – a strategic asset – and why should we do it? The volume and complexity of corporate content make treating content as a strategic asset one of the biggest challenges of our day. “I believe that a crisis is fast approaching for many enterprise marketers who are scaling their content-production efforts … We all know that we need to produce content like a media company. But our existing people, practices, and technology are not there yet.” – What Is Big Content? Ponder this: In what ways does your organization already treat content as a strategic asset – something that people plan, distribute, promote, and manage so that it supports your business goals in measurable ways? What more might you do? “For some reason, customer-facing content – the thing that creates the customer experience our business will be known for – is treated differently. When a company is stuck in this pattern, content … may be hurting the brand.” – Who’s Afraid of Strategy in Content? Having once worked for a company that excluded content from its user testing, I want to cheer every time I hear this message. The company I worked for in those days had formed a UX group, a big deal back when the term “user experience” was new. I wrote user documentation for highly regulated products that might affect life-and-death decisions. It seemed only logical to me – mandatory, even – that the UX group would test not only the product usability but also the information usability. Customer-facing content is part of the customer experience, right? Customers, you know, face it. Didn’t happen. I couldn’t convince anyone in the testing group to include the documentation in the usability tests. The company defined user experience as product experience. Content wasn’t seen (by the suits) as part of the product; it didn’t count. I still get worked up when I think about that mindset. Deep breaths. Robert is here. Content, he says, is part of the customer experience. It may just be the most important part. Ponder this: How does your organization find out about the customer experience of your content? How could it find out more? Social media and digital content have created a marketing landscape that requires a new set of tools to manage marketing teams, integrated strategies, and growing amounts of content. Find out how you can transform your content marketing with the one tool you can’t afford to live without in 2015: The Content Marketing Hub. “In just one year, the number of marketing-technology companies has gone from 947 to more than 1,800. It has doubled in a year … I searched through a couple of job sites for ‘content strategists’ and found on one site almost 5,000 jobs that contained ‘well versed in technology’ as part of the job description … What does all this mean? … As you move through your career as a content marketer or content-strategy practitioner, how well do you need to know technology? The answer is, as well as possible.” – How Well Do You Need to Know Technology? You might wonder why Robert’s research included looking at what it takes to do a content strategist’s job. Content marketers are not content strategists. But content marketers do have a lot to learn from content strategists. That’s one of CMI’s big themes for 2015. Getting techier is just one way in which we need to learn from the folks in related content professions. When it comes to IT, we’ll never keep up with the changes. Keeping up isn’t the goal. The goal is to keep learning. Robert pursues a similar theme when he evokes Bruce Wayne just after he has climbed a mountain in the movie Batman Begins. “Bruce Wayne, searching for training to master his fears, gives a symbolic blue flower to Henri Ducard (no spoilers). Bruce has been told that delivering this flower to the top of the mountain will enable him to find what he’s been looking for. Henri takes the flower and says, ‘To manipulate the fears in others, you must first master your own.’ Then he asks, ‘Are you ready to begin?’ Breathless, Bruce says, ‘I can barely stand.’ With a powerful kick to the chest that knocks Bruce halfway across the room, Henri yells, ‘Death does not wait for you to be ready!’” – Are You Ready for the Next Level of Digital Content? We are Bruce Wayne, and technology is about to deliver that kick to the chest. How about it? Robert asks. (Is that a blue flower in his hand?) Are we ready to begin? Ponder this: What do you need to learn next about technology? How will you get that knowledge? When will you do it? “Yeah, this is the same ‘snap’ that today’s moviegoers experience. Computer and robotics engineers have a name for this phenomenon: the Uncanny Valley. The ‘valley’ is the dip in people’s comfort level when they encounter a nearly human image – a likeness that’s a little bit off. People feel repulsed rather than attracted to the almost-but-not-quite real. With our marketing content, this ‘snap’ into the Uncanny Valley is not good. It’s lazy directing, and it’s lazy content.” – Can You Be the Steven Spielberg of Content? How do we as marketers avoid the Uncanny Valley? Be like Spielberg. Use technology only when you need it. Strike a balance between technology and humanity. Ponder this: In what ways might your customers feel weirded out or even repulsed by the experiences they have with your organization’s content? If you think no one is ever repulsed, how do you know? How could you test your assumptions? Robert calls for marketers to change. At the same time, he understands the paralyzing fear of change. He stares down fear in several newsletters. “Expanding the remit of marketing into a group that creates valuable, content-driven experiences (rather than simply describing the product) using product-development methodologies for that content (rather than campaign-minded tactics) is the evolution of marketing … We’d better not be afraid to give it our all to make this evolution happen.” – Are We Reaching High Enough? Robert again urges us to take action in the face of fear. 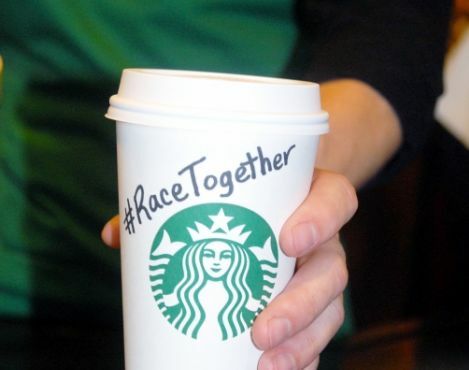 In that newsletter, he recalls the Starbucks #RaceTogether campaign, which encouraged baristas to write the hashtag on cups and to talk about race. While leaders at all levels need to take action in the face of fear, those who control the big budgets often find themselves in Robert’s sights: “We have to change. We have to get over the fear of the different. The C suite must see content as one of the most important things to get right.” – Who’s Afraid of Strategy in Content? Go ahead, apply those words to your life. Robert dares you. Ponder this: What one action calls to you right now? If you took that action, what’s the worst that could happen? The Content Strategy for Marketers newsletter goes out via email every Saturday. I look forward to reading it every week. I bet you would, too. One of these weeks, we’re bound to find out what happened with the third-grade teacher and the goat.